STATEN ISLAND, N.Y. (April 22, 2014) – The ‘Mob Wives’ book-signing and dinner event originally scheduled for Thursday at the Mansion Grand, featuring Alissia’s Café, Great Kills, will instead take place on May 29. The gathering will feature VH1’s “Mob Wives” celebrities and authors Jennifer, Renee and Lana Graziano, and series co-star Angela “Big Ang” Raiola. 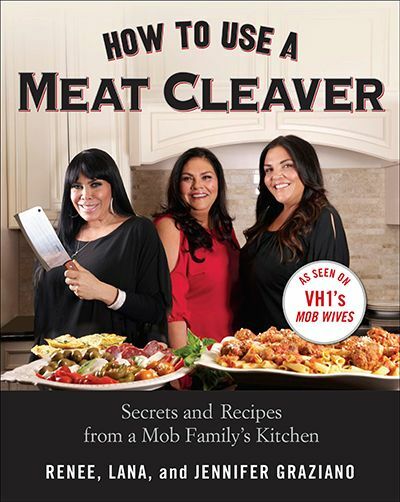 The event, which will celebrate the Graziano sisters’ book, “How to Use a Meat Cleaver: Secrets and Recipes from a Mob Family’s Kitchen (Perigee, 2014), will take place as initially planned in the popular Staten Island food establishment at 141 Mansion Ave., Great Kills. Two seating times are available: 6:30 p.m. or 8:30 p.m. Admission of $90 per person, includes a three-course dinner, an autographed hardcover edition of the book and photo opportunities alongside the celebrities. Reservations are a must; a deposit of $20 per person is required. In the book, the Graziano sisters share 100 of their favorite and most coveted family recipes, including: Sicilian-style codfish; lobster arabiatta; parmigiano-baked rigatoni with cauliflower, peas and prosciutto; penne with fried eggplant; Sunday gravy; tripe alla Romania; chicken with sausage, peppers and onions; veal osso bucco; escarole and beans; caponata; Sicilian rice balls, and more. They also share never-before-heard stories and anecdotes from inside one of the most famous alleged mob families of our day (like how to sneak meatballs to family members in prison). For information regarding reservations for this special evening, the Mansion Grand, featuring Alissia’s Café, may be reached at: 718-605-9200. Overlooking the panoramic vista of Great Kills Harbor, the Mansion Grand, featuring Alissia’s Café, is a popular Staten Island, N.Y., destination for catered parties in its private banquet rooms, and Italian/Continental dining in its restaurant.